PanARMENIAN.Net - After almost three hundred years of neglect, the Portuguese church in Thanlyin, Myanmar is being brought back to life. Construction on the church is believed to have begun in 1749, after Italian Catholic priest Paolo Nerini, a missionary from the Barnabite Order, obtained permission from King Binnya Dala, who reigned from 1747 to 1757, to build a church to replace a wooden one originally built by the Portuguese. Construction of the church was believed to have been funded by an Armenian, Nicolai de Agualar and Margarita, his wife, The Myanmar Times reports. Inside the church, there is an inscription in Armenian regarding Agualar. 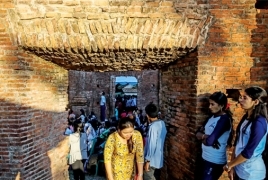 The Department of Archeology and National Museums first began work to preserve the remains of the church, with walls measuring 24 metres long, 10m wide and 12m high, two years ago, centuries after it had been damaged in wars in the 1750s and Typhoon Nargis in 2008. In 2016, the Catholic Church of Myanmar instituted an effort led by Bishop John Saw Yaw Han to clear the grounds of the church and have it fenced off as the ruins had become frequented by drug addicts. Last month, a ceremony to consecrate the land the church is located on was held inside the compound. Over 2000 Catholic devotees came together to celebrate mass in the remains of the church on January 12. The Department of Archeology and National Museums is also conducting proper research and excavation work on the site to learn more about its history.